Amongst my family members there are those who clearly favorite one or the other, and there are those that don't care, as long as it's pie. And then there are those who don't even like pie. My brother-in-law loves pumpkin pie, my husband's whole family really. Growing up they used to buy a stack of pumpkin pies for Thanksgiving. I, on the other hand, love pecan pie. Specifically homemade. And guess what? November is Georgia Pecan Month, which I think speaks very highly of which is the better pie for Thanksgiving. Don't get me wrong, pumpkin is great. But pumpkin is better put to use in a cheesecake than a pie, in my humble opinion. 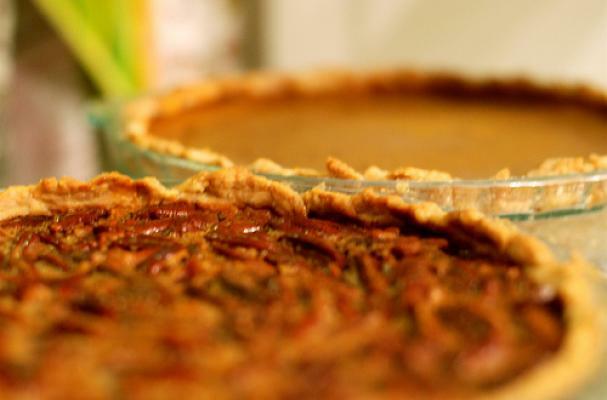 Which is your favorite pie, pumpkin or pecan? Maybe strike a compromise with Pumpkin Pecan Pie? Are you one of those no-pie people? Or do you serve an entirely different dessert at your Thanksgiving feast? From the perspective of a long time pie enthusiast and consumer (Randy, not Kim, who has disqualified herself as she has never liked pie, strange and disturbing but true) I recommend that you make BOTH. First, because I LIKE both and second, because it is SUPPOSED to be a feast! And you need leftovers! And how do you expect to feed people with only ONE pie?!?!! And for universal appeal, adding a third option; apple (with pecans in it) wouldn't be out of line. My 34-1/2 cents.